It’s a phrase I’ll admit I’ve said far too often during the wedding planning process with Femi. It’ll usually be about some detail that I think is unimportant, but one that still should have been run by him. With our wedding almost 100 days away (but who’s counting), I’m learning some important things about communication. For example: our wedding colors. We were with a group of friends when someone asked me what our wedding colors are. When I quickly responded “purple, gray and gold,” Femi gave me a shocked look and said, “Oh really? When did we decide this?” I was taken aback because I assumed he didn’t care what our wedding colors were, and it was OK for me to make the decision myself. But we never actually discussed it. My friend didn’t ask me what MY wedding colors were, she asked what OUR wedding colors were. It led to a tense discussion later about how even though he was fine with what I chose, I should have discussed it with him first, and he’s absolutely right. This type of situation is not just limited to secular aspects of the wedding. There were some Jewish wedding traditions I assumed we would do. Like the hora. It never occurred to me to ask Femi if he felt comfortable doing the hora. It’s a dance he doesn’t know, his family doesn’t know it, and he might not want to be lifted in a chair. But when my mom jokingly asked us who we’d assign to lift us, Femi responded with “Oh, are we doing that?” Initially I said “Of course!” But when asked why, I obviously had no good answer. 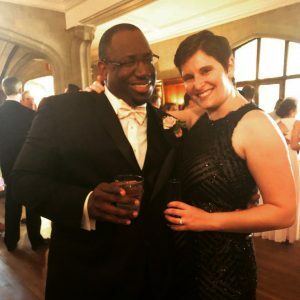 It seemed like a typical Jewish wedding tradition to me, but I didn’t think about the fact that it was totally foreign to Femi’s family. I am still not sure if we’re definitely doing it! Discuss which portions of the ceremony/reception are important to you and which are important to your partner. Some couldn’t care less about the venue as long as they have a rocking band, while others focus on the food and décor. You’ll never know until you have that conversation. Figure out how you and your partner make decisions. I learned that Femi gets overwhelmed if he has too many options to choose from, so when possible, I’ll narrow our options down to 3-5, and then we make the final decision together. Others are the complete opposite; they need to see every available centerpiece before choosing the right one. Take your time! There should rarely be a situation where someone needs a decision about something right away. Take your time to discuss whatever it is with your partner—they will appreciate that courtesy. Femi has been extremely patient with me as I sift through all the details of the wedding; but it is important to set up a good system at the beginning of the planning process and stick to it throughout. It will prepare you and your partner for being on the same team in life. Above all else try as hard as you can to find the joy in the process. There will be a lot of things that try to drag you down, and it’ll be up to the two of you to shake off the funk and get ready to dance! Becky is the associate director of InterfaithFamily/Atlanta. << Previous: Should Our New Home Have a Cross or a Mezuzah (or Both)?